As soon as Sierra Abrams announced she was self-publishing her book, I added it to my TBR right away. I was so excited for The Color Project, and it did not disappoint! Bee has just graduated high school and doesn’t know what she wants to do next. For now, she’s working a summer job at a florist shop and spending time with her family. When her car breaks down, she meets the new mechanic at the local shop, Levi, who wears brightly colored sweaters. Intrigued by this (and his pretty face), Bee finds out that Levi runs a charity called The Color Project. Bee proceeds to throw herself into this new organization, especially after she receives the news that her father has been diagnosed with brain cancer. Family is the most important thing in Bee’s life. She’s close with her parents, older brother, and two younger sisters. It was so refreshing to see positive family relationships in a YA novel, something that I do not see too often. As someone who has close relationships with her parents and brother, I really appreciated seeing these positive relationships in Bee’s life play out. If you’re a fan of slow-burn romances, you will love Bee and Levi’s story. They instantly connect when they meet, but they become friends first before pursuing any kind of romantic relationship. I loved that they took their time getting to know each other before jumping into a romance. It made their relationship and connection so much realer since they had a friendship, even though both of them were obviously attracted to the other. They took their relationship slowly and made sure to support the other, which is important. Levi was especially there for Bee and supported her during the hardest point in her life as she watched her father’s health fail. The Color Project is actually a pretty long book for a YA contemporary, so I took my time reading it. However, just because I read it slowly, doesn’t mean I didn’t like it. In fact, I loved it! The first half of the novel is more light and fluffy as Bee and Levi get to know each other while the second half becomes more serious with Bee’s father’s diagnosis and deteriorating health. These two contrasting halves beautifully showcase life’s ups and downs, and even how there can still be little patches of happiness when life throws the worst at you. Like I said earlier, The Color Project is on the longer side. Even though I enjoyed the book, I do think it was a little too long and needed to be shortened. 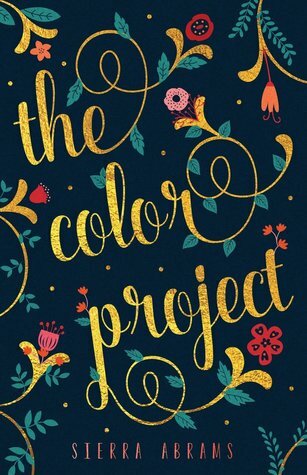 Overall, The Color Project is a heartfelt debut novel full of family, friendship, and love—a must read for fans of Morgan Matson! This sounds like a wonderful read. Great review!! I hope you love it as much as I did, Elise!! Levi is an absolutely precious soul. The Color Project sounds so good! It was really good!! I hope you enjoy it as much as I did! Oh wow, this sounds like it is going to be quite an emotional, character driven read. Which are all things I usually like myself! I also read a lot of self-published books already and know how handy it is to support these kind of authors. Great review! TCP is definitely an emotional read—I hope you enjoy it as much I did! And thanks!